GEORGIA FUNERAL DIRECTORS ASSOCIATION, INC. is the oldest and largest funeral service professional association in the state. Founded in 1899, we currently provide the following services. Our goal is to facilitate a basic understanding of the funeral and grief process so that families are better equipped to deal with the loss and ultimate closer of significant relationships in their lives. EDUCATIONAL PROGRAMS: The association offers continuing education forums at various times throughout each year, featuring presentations on topics that are timely, cost-effective, and highly informative to funeral directors and embalmers. The majority of these programs are approved for Continuing Education (CE) credit by the Georgia State Board of Funeral Service. The GFDA Annual Conference, held in June of each year, provides the opportunity for members to keep abreast of the rapidly changing funeral service environment through seminars led by industry renowned professionals. Our other yearly meetings include our Mid-Winter Conference in February, and our District Meetings held each Fall. These meetings provide opportunities for members to gather and discuss the most current issues involving the association and the funeral service profession. The Mid-Winter Annual Conference and District Meetings each afford continuing education and forums for discussion on current issues and legislation. PUBLICATIONS: GFDA publishes a newsletter that is distributed to all members throughout the state. “GFDA StraightTalk” provides information about association activities and funeral service for dissemination to the membership. For example, the newsletter provides timely updates about legislative matters, recent GFDA events and photos, upcoming events, tax and regulatory updates, and deadline reminders for license renewal. The newsletter appears in a digital version and is distributed each month to membership. The "GFDA Alert" is a email notification publication that is distributed to member emails on a routine as-needed basis. It includes late-breaking details, updates, legislative actions and compliance material. Perhaps most important, GFDA Alert serves as a notification to membership for deaths within the funeral profession, primarily licensed funeral directors, sales associates and/or members of their immediate families. Submitting death notification within the profession is easy; simply call the GFDA office to alert staff the information is being sent, followed by an email of the information. Unlike a funeral establishment, the office operates during routine Monday to Friday business hours; however, staff is always available for phone notification. STATE AND FEDERAL LEGISLATION: GFDA, the Executive Committee, Executive Director and registered Lobbyist, continuously monitors legislation of interest to the funeral service profession. GFDA monitors legislation and expresses views of the association to elected leadership of Georgia. Additionally, the Lobbyist and Executive Director maintain close working relationships with state regulatory agencies, related funeral industry organizations, the insurance industry, and the business and legal communities. On the national level, GFDA corresponds with members of the Georgia Congressional Delegation regarding federal issues of concern to the funeral profession. The association maintains the Georgia Funeral Directors Association Political Action Committee (GFDA PAC). The GFDA PAC forms the basis of contributions to political campaigns and allows the association to take a proactive stance in the elective process in Georgia. Through the GFDA PAC, the association lends our support to candidates who are advocates of GFDA views and opinions as regards funeral service profession legislation. PAC contributions may be made at any time through personal funds only; no company/corporate funds can be accepted. NATIONAL FUNERAL DIRECTORS ASSOCIATION: GFDA, through a choice/federated membership structure, is the designated state liaison with the National Funeral Directors Association and maintains a close working relationship with them. The largest funeral service organization in the world, NFDA offers a wide range of services and benefits to its members, including input on key federal legislation, federal compliance information, public relations tools, “The Director Magazine” subscription, workshops, and more. GFDA is represented on the NFDA Policy Board, an advisory committee to State Associations and members. Additionally, GFDA has its own delegates and alternate delegates to the NFDA House of Delegates, the governing body of NFDA at the annual meeting. PUBLIC RELATIONS: GFDA, through its Executive Committee and Executive Director, serves as a resource center for information on all aspects of funeral service. Calls are fielded daily from members, non-members, news media and the general public requesting assistance, from employment opportunities to public awareness questions to consumer concerns. GFDA serves as a clearinghouse for the public on questions about all aspects of funeral service, and strives to answer all questions in a courteous manner while providing a greater understanding of the funeral service profession. We are proud to announce the 2018-2019 GFDA Executive Committee Members. 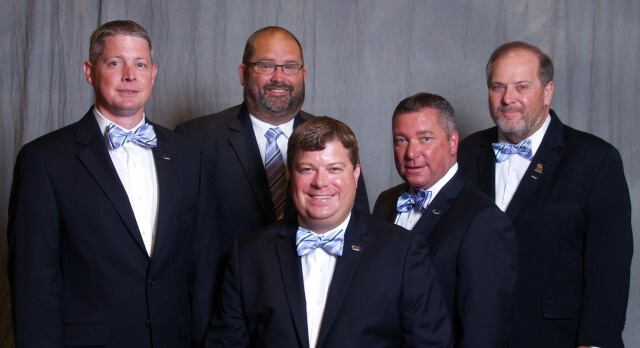 These gentlemen were elected during our 2018 Annual Convention. Bill Hightower, President-elect & NFDA Policy Board Member; and David McLeighton, Past President.